343. What is the Holy Eucharist? (a) The whole Christ is really, truly, and substantially present in the Holy Eucharist. We use the words "really, truly, and substantially" to describe Christ's presence in the Holy Eucharist in order to distinguish Our Lord's teaching from that of mere men who falsely teach that the Holy Eucharist is only a sign or figure of Christ, or that He is present only by His power. (c) The word "Eucharist" means "Thanksgiving." 344. When did Christ institute the Holy Eucharist? Christ instituted the Holy Eucharist at the Last Supper, the night before He died. (a) About a year before the Last Supper Our Lord promised to give us the Holy Eucharist. This promise is related in the sixth chapter of the Gospel according to Saint John. The fulfillment of this promise took place at the Last Supper. 345. Who were present when Our Lord instituted the Holy Eucharist? When Our Lord instituted the Holy Eucharist the apostles were present. 346. How did Christ institute the Holy Eucharist? Christ instituted the Holy Eucharist in this way: He took bread, blessed and broke it, and giving it to His apostles, said: "Take and eat; this is My body;" then He took a cup of wine, blessed it, and giving it to them, said: "All of you drink of this; for this is My blood of the new covenant which is being shed for many unto the forgiveness of sins;" finally, He gave His apostles the commission: "Do this in remembrance of Me." 347. What happened when Our Lord said: "This is My body . . . this is My blood"?When Our Lord said, "This is My body," the entire substance of the bread was changed into His body; and when He said, "This is My blood," the entire substance of the wine was changed into His blood. (a) Christ could not have used clearer, more explicit words than "This is My body." He did not say, "This is a sign of My body," or "This represents My body," but, "This is My body." Catholics take Christ at His word because He is the omnipotent God. On His word they know that the Holy Eucharist is the body and blood of Christ. 348. Did anything of the bread and wine remain after their substance had been changed into Our Lord's body and blood? After the substance of the bread and wine had been changed into Our Lord's body and blood, there remained only the appearances of bread and wine. (a) Because the appearances of bread and wine remain in the Holy Eucharist, we cannot see Christ with our bodily eyes in this sacrament. We do see Him, however, with the eyes of faith. Our bodily eyes, moreover, do not deceive us when they see the appearances of bread and wine for these appearances really remain after the Consecration of the Mass. 349. What do we mean by the appearances of bread and wine? By the appearances of bread and wine we mean their color, taste, weight, shape, and whatever else appears to the senses. 350. What is the change of the entire substance of the bread and wine into the body and blood of Christ called? The change of the entire substance of the bread and wine into the body and blood of Christ is called Transubstantiation. 351. Is Jesus Christ whole and entire both under the appearances of bread and under the appearances of wine? Jesus Christ is whole and entire both under the appearances of bread and under the appearances of wine. (a) We know that Christ is whole and entire under both appearances because, "Christ having risen from the dead, dies now no more" (Romans 6:9). Because Christ cannot die, His blood must remain united always to His body, and His soul to both. The divinity of Christ, moreover, always remains united to His body and blood and soul because He is God made man. (b) The whole Christ is present under each part of the sacred appearances and remains present as long as the sacred appearances remain. 352. How was Our Lord able to change bread and wine into His body and blood? Our Lord was able to change bread and wine into His body and blood by His almighty power. (a) God, who created all things from nothing, who fed the five thousand with five loaves, who changed water into wine instantaneously, who raised the dead to life, can change bread and wine into the body and blood of Christ. Although the Holy Eucharist is a great mystery, and consequently beyond human understanding, the principles of sound reason can show that this great gift is not impossible by the power of God. 353. Does this change of bread and wine into the body and blood of Christ continue to be made in the Church? This change of bread and wine into the body and blood of Christ continues to be made in the Church by Jesus Christ, through the ministry of His priests. (a) Only ordained priests have the power of changing bread and wine into the body and blood of Christ. When they consecrate, they act in the person of Christ, through the power received in the sacrament of Holy Orders. 354. When did Christ give His priests the power to change bread and wine into His body and blood? Christ gave His priests the power to change bread and wine into His body and blood when He made the apostles priests at the Last Supper by saying to them: "Do this in remembrance of Me." 355. How do priests exercise their power to change bread and wine into the body and blood of Christ? Priests exercise their power to change bread and wine into the body and blood of Christ by repeating at the Consecration of the Mass the words of Christ: "This is My body . . . this is the Cup of My blood." 356. Why does Christ give us His own body and blood in the Holy Eucharist? 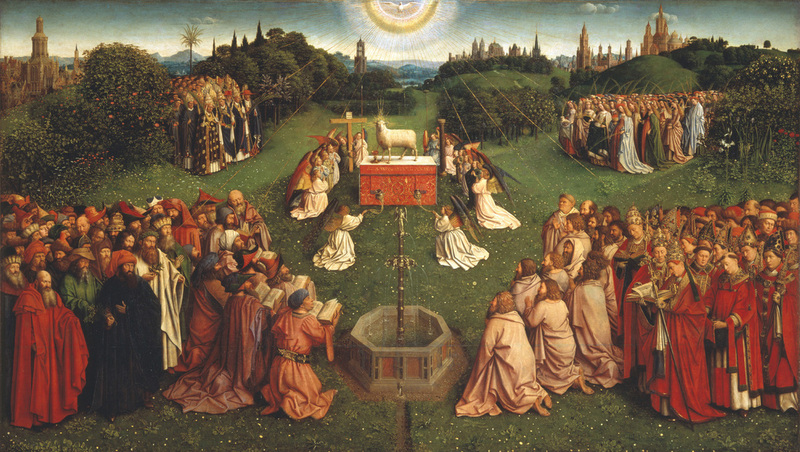 Christ gives us His own body and blood in the Holy Eucharist: first, to be offered as a sacrifice commemorating and renewing for all time the sacrifice of the cross; second, to be received by the faithful in Holy Communion; third, to remain ever on our altars as the proof of His love for us, and to be worshipped by us.